Susan's Disney Family: Get organized with a ShelfPack a new kind of luggage with built-in shelves, a must for travel! Get organized with a ShelfPack a new kind of luggage with built-in shelves, a must for travel! Are you looking for an easier way to travel? Seems like every year it gets a little tougher to travel, from the cost of airline tickets, to the hidden fees, and something we’ve taken notice of recently the lack of drawers in hotel rooms! 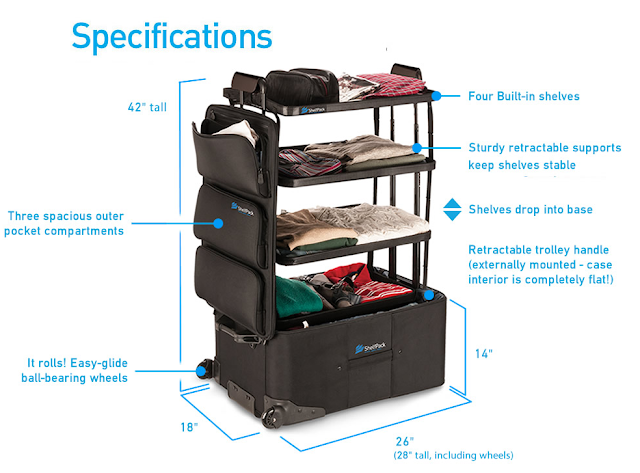 The ShelfPack is a new innovation in travel, that will make traveling a breeze! What exactly is a ShelfPack, and how did this come about? Well, the inventor of the ShelfPack, Ken McKaba, was on a long business trip where the idea hit him, he would come up with a suitcase with shelves to make his gear easier to see and get. He started tinkering around and dismantling old luggage for parts and sewing some shelves. He experimented with multiple variations and took the prototypes he made on business and family trips. The idea evolved and improved. Then a a well-established luggage source built the pack Ken was dreaming of and the “ShelfPack” was born. I must admit I’m not the packer in my family, my husband is. He’s a wiz at making things fit and he has the tiny fold down to a science! But whenever we go places we like to take one bag each and it’s difficult for him to do because guy’s clothes are bigger and take up more space and don’t even suggest recycling shorts! New shorts/pants every day, no questions. We just returned home from vacation and this trip we had a new weapon in our arsenal the ShelfPack Arrive, open, relax. That is their motto and I’m here to tell you that it is 100% true. My husband looked at the ShelfPack like it was the second greatest invention ever produced (air conditioning is his favorite so it’s going to be tough to top it.) What is the ShelfPack? 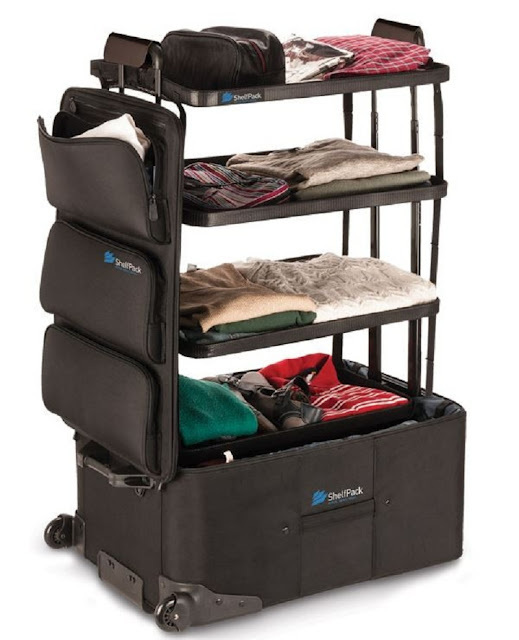 It is luggage that has a shelving unit that pulls out from the bag making it both a suitcase and a place to store your clothes while you’re away. The shelves pull up from the bag and hook on to handles to keep them upright and sturdy, and these shelves are sturdy! You may wonder since this bag has the shelves in it already is it really heavy? No, empty the bag weighs 14.5 pounds, yes a little heavier than the average bag but not that heavy at all. There is still plenty of weight that can be added before you hit the max weight for airline travel. Hubby loaded them up with his shorts and managed to fit 8 pairs of shorts on the bottom shelf neatly. His shorts aren’t some thin dainty little shorts either, they’re heavy cargo shorts and the all fit comfortably. That’s just one shelf! There are 4 shelves total, plus 3 pouches on the outside of the bag and the actual body of the ShelfPack is deep. underwear, 2 pairs of sneakers, a shaving kit, and a travel hat box….and he had room on the shelves for other things! He was astonished, as was I. This bag is amazing. Like I mentioned before the drawer situations in hotels now are pretty bad, we’re used to getting 3 drawers that aren’t that large, so that is 1 drawer a piece and when you’re staying somewhere a week or so….well that’s just not enough! With the ShelfPack you’ll never have to unpack, and because my husband’s clothes stayed in the ShelfPack for the week, my daughter and I had more room for our clothes. (well that is until I pick up a ShelfPack for myself and my daughter, now that will make traveling a breeze!) ShelfPack’s arrive, open, relax tag they use is absolutely true. My husband put the luggage down, unzipped the lid, pulled up the two stabilizing shelf handles and pulled the shelf up clipped them to the handles and was finished. It took me longer to type that sentence then it did for him to “unpack”! Want to make sure your luggage is quality? Well ShelfPack wants to make sure this luggage is there for the long run for you too with the ShelfPack has a Limited lifetime warranty, the ShelfPack’s lifetime warranty covers workmanship and materials against defect for the entire life of the product. During this period, if the product is covered by the warranty, we will repair or replace it at our discretion. (Contents of your bag, normal wear and tear, abuse and cosmetic wear and tear are excluded). Take less time unpacking, just arrive and enjoy your travels, be it for a business trip or a vacation, this will be a bag you will adore, this will be your go to bag. The 360 degree spinning wheels was the best thing to happen to the world of luggage until the ShelfPack came along and takes its rightful place as the king of the hill. Would having a ShelfPack make your traveling life easier? Would having a ShelfPack make your traveling life easier? I love this idea! Those shelves would make packing so much easier. Excellent luggage. We will be looking for new luggage soon, this is a great idea! My question would be how heavy is it considering the airplanes are now charging for 50 pounds and above. Jeannette, this is 14.5 pounds not that heavy at all... My husband pack it pretty well and it only was 40 pounds... so he still had 10 pounds to work with. Wow. I do a bit of traveling over the year and this would be perfect. No more digging around in the luggage to find something. What an ingenious idea. This would save so much time. I need to see about getting new luggage. Wow!!! That is amazing and actually makes me kind of excited to pack for trips! I want one!! This luggage looks amazing! I definitely need this for some of my upcoming adventures. This luggage is perfect for someone like me that loves organization. Travel stresses me out simply from packing. This would help with that. This looks like the ultimate in packing organization. Wow! My family could totally use this! What?!! This is amazing! I travel a lot and oh my gosh I NEED this now!!!! I could really use a suitcase like this. I will have to ask for a ShelfPack for my birthday. The ShelfPack looks like a perfect suitcase for me. I am always over packing and running out of room. I have a lot of travelling coming up and I need new luggage. The ShelfPack looks amazing. I will have to pick one up and give it a try. Love it! I need one of those! Can't wait to check it out! Well that is fancy! I could pack each kids stuff separately. How handy. That is so cool and innovative! I travel a lot so I know how living out of a luggage can be sifting threw your clothes trying to find an outfit. This keeps you super organized! This looks amazing. I travel frequently for work and pleasure so I can definitely going to consider getting one of these to make unpacking easier. This is seriously perfect for staying organized on trips. I really like this! Wow, this is such a cool concept! I really love that it is like two products in one! ShelfPack is truly a wonderful idea. I never saw anything like that. We do not travel often, but if we do, I would definitely consider getting this. Wow! I have never seen a bag like this and I love it!! This would be so awesome for vacation! The suitcases all look so elegant. I would be proud to go on vacation with these fine bags. This is a great idea! 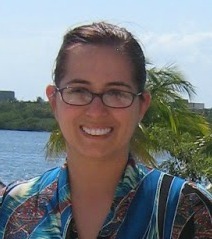 It would be so much easier to keep things organized & not have to dig thru the suitcase to look for a particular item. How neat!! What a great time saver too. I usually don't unpack many of my things in fear of losing them because I leave them behind. This way I can get to my things without having to sort through everything in my bag to find things. I love it! I wonder if it would pass though airport security with no problems.